“Inviting Arthur Kurzweil to London to perform magic for our Made in Heaven singles event was the best decision we ever made! Having a speaker of his caliber caused the event to be inundated with three times the amount of expected attendees. 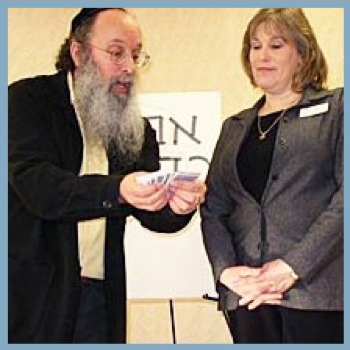 – Rabbi Ron Isaacs, Temple Sholom, Bridgewater, N.J.
– Debbie Hercky, Adult Education Temple Sholom, Bridgewater, N.J.
“Arthur Kurzweil spoke at our Synagogue and he was a tremendous hit! 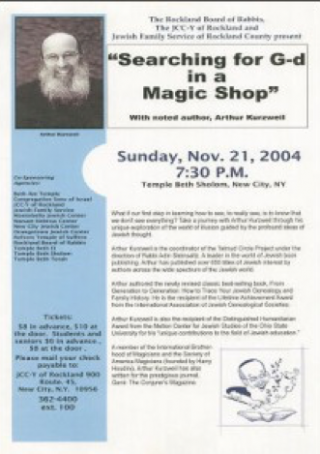 Who ever thought that there could be a “Jewish Magic Show”? And who ever figured that something so entertaining could be so profound, and meaningful? Harry Houdini may have been a rabbi’s son, but many would agree that there’s nothing particularly Jewish about stage magic. And yet to Arthur Kurzweil, that’s just, well, an illusion. Kurzweil demonstrated his innovative exploration of “eternal Jewish spiritual ideas” at a Jan. 7 program, “Searching for God in a Magic Shop,” at the Jewish Community Center of Middlesex County in Edison. As Kurzweil performed tricks with a deck of cards, numbers, and postage stamps, he tied each into a discussion about a concept in Torah, Talmud, or Jewish history. He also presented the audience with an overview of the Jewish influence on stage magic. While Jewish tradition frowns on magic and wizardry, rabbinic law permits sleight of hand as long as the entertainers make no claims about having special powers. Even the most famous phrase in stage magic — “abracadabra” — has Jewish roots. Kurzweil said the incantation is a corruption of the Aramaic phrase avra k’dabra, meaning “I will create as I speak” and was probably a reference to God’s great “trick” of creating the universe. And of course there was Houdini, born Ehrich Weiss, the son of a Hungarian rabbi who brought his family to Appleton, Wis. The famed escape artist is “buried in a Jewish cemetery in Queens,” said Kurzweil. A member of the Society of American Magicians — founded by Houdini — and the International Brotherhood of Magicians, Kurzweil has written for the journal Genii: The Conjurers’ Magazine. He said he has been interested in magic since his father took him to a store to purchase a costume for his third-grade play and he spotted some magic tricks on the counter. 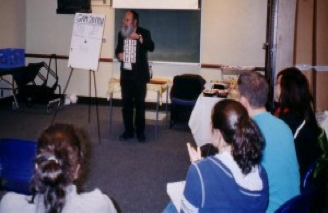 As a Jewish educator, Kurzweil is the author or editor of 30 books, including The Encyclopedia of Jewish Genealogy, Kabbalah for Dummies, and the recently published On the Road with Rabbi Steinsaltz, about his friendship with renowned talmudist Adin Steinsaltz. Kurzweil’s Jewish and magical sides combined as he discussed one of his favorite books, Steinsaltz’s The Thirteen Petalled Rose. 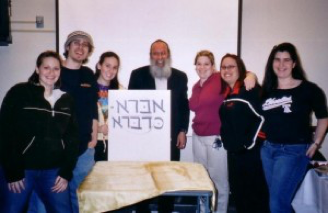 As he explained Steinsaltz’s thoughts on the different levels of angels in the four kabalistic worlds and how the mitzvot we do create and energize them, Kurzweil called up Jennine Shpigel, the JCC’s director of Jewish and family programming. 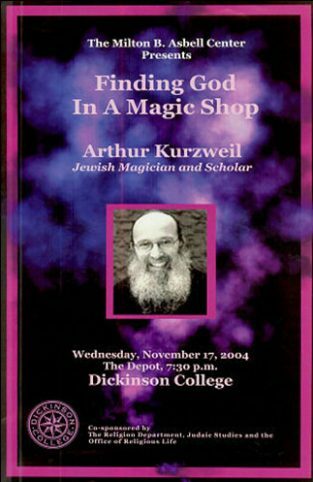 While a copy of the Steinsaltz book — sealed in a plastic bag “to prevent fingerprint smudges” — was being circulated through the audience, Kurzweil asked Shpigel to select a card from a deck he was shuffling. She chose the four of hearts, which Kurzweil held up for the audience to see. He then asked the audience member who had the bag to unseal it and remove the book and shake it. Out dropped the four of hearts. For Kurzweil, however, knowing the secret behind a trick or illusion would strip it of its magical properties, just as fully understanding the workings of God would eliminate the need for faith. “Arthur’s visit to Portland was a huge success on many levels. It was an amazing community-building weekend with four congregations and the Jewish Genealogical Society co-sponsoring his visit. Over three days he spoke for over an hour in two services, led Talmud study, gave a Kabbalah lecture, was the honored guest at a Patron Brunch, did his renowned Magic Show and finally led a two part Genealogy workshop. “Arthur Kurzweil’s presentations are everything you could want from a speaker and more. They are educational, entertaining, moving and meaningful. At our synagogue he has offered lectures, adult education classes, religious school programs, and scholar-in-residence weekends. “Initially, Arthur introduces himself to the assembled children and parents in delightful fashion. He possesses a naturally charismatic and engaging personality, investing the audience in his program virtually from the moment he begins to the conclusion of his final trick. Arthur presents a wonderful arsenal of illusions and sleight of hand, combining humor and his obvious and stated love of books and libraries with a heavy dose of audience participation. And therein lies one of the most impressive aspects of Arthur and his program. Arthur constantly points to titles that he requests be pre-prepared, and informs the children that a world of magic and wonder can be found within the very room in which his magic is being performed. While performing, Arthur gustily endorses reading, informing the assemblage how very important it is to both visit and support their local library. While libraries are continually trying to impress this fact upon their patronage, having someone like Arthur do so can really serve to make a difference. But, Arthur doesn’t stop there. All children like to feel “important.” Arthur successfully indulges this need by soliciting audience participation and making inquiries of the children. When Arthur does elect to bring a child up to the stage, he makes certain to put the child at ease as being in front of 80+ patrons can prove to be intimidating to a youngster. Arthur has the child help him perform the trick and ensures that the child’s cooperation is acknowledged and appreciated by the audience. This serves to make that child feel important and integral to the performance. At the end of Arthur’s show he conducts a trick wherein a dollar bill is locked within a wooden framework. Once the dollar is freed, Arthur donates it to the library and informs the assembled patrons that there are any number of ways to help support their local libraries, financial donations being but one. “I would like to recommend Arthur Kurzweil to any group who would like a professional, well-prepared and interesting presenter of magical fun. He came to my library as part of the 2004 Summer Reading Club, which featured the theme: “Discover New Trails at Your Library.” With his library background, he was able to link his magic tricks so neatly to books and the library that I felt we had a very effective public relations person working for us. He also alerted me ahead of time to the topics he would cover in his show, so that I was able to bring in library books to display, which he encouraged the audience to check out after the program. The audience really seemed to enjoy his patter, also and were anxious to participate in the magic tricks.